What about Xwi7xwa is special? Xwi7xwa Library and First Nations House of Learning 20th Anniversary celebration. New Aboriginal Engagement Librarian – one year term position created, and hired. New Technical Services and Cataloguing Assistant position created, and hired. Building renovation completed to create 2 new office spaces. New Reference Librarian position created, and hired. Xwi7xwa Library becomes a branch of the University of British Columbia Library. 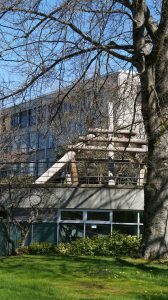 Gene Joseph First Nations Scholarship created at the UBC School of Library, Archival and Information Studies through an endowment established by the British Columbia Library Association – First Nations Interest Group and the UBC First Nations House of Learning. Head Librarian position created, and approved by University Senate. Gene Joseph, founding Head Librarian 1995-1997. 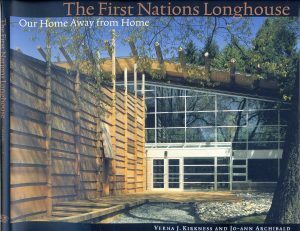 The First Nations House of Learning Longhouse and Library facility opens. Chief Simon Baker names the Library, Xwi7xwa, “echo” in the Squamish language. William and June Bellman donate $1M to the library. Verna Kirkness, Director, First Nations House of Learning, wins a Stauffer Foundation Grant for Gene Joseph to build the collections. 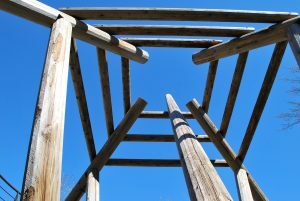 British Columbia Native Indian Teacher Association (BCNITA) and UBC Faculty of Education create the Native Indian Teacher Education Program (NITEP). What is the story of the logo? Tsimshian artist Glen Wood created the First Nations House of Learning logo. 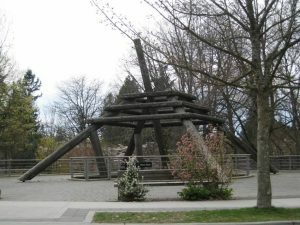 It consists of a human face surrounded by two ravens, which also form the frame of a longhouse. The face is a humanoid with frog-like features and represents First nations people. The house design represents the university, or “House of Learning” which is the way some Aboriginal languages refer to schools. The Raven, a symbol of creativity and learning, is also known as a trickster or transformer in many First Nations cultures. As represented here, Raven is transforming the university to reflect First Nations cultures and philosophies, linking the university to First Nations communities. How do you pronounce the name of the X̱wi7x̱wa Library? What does it mean? X̱wi7x̱wa is pronounced ‘whei-wha.’ X̱wi7x̱wa means “echo” in the Squamish language, Sḵwx̱wú7mesh Sníchim. 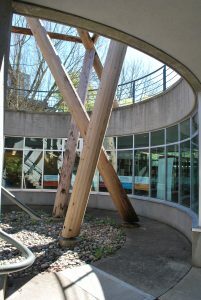 Chief Simon Baker of the Squamish Nation gave the name to the library at the First Nations House of Learning Opening Ceremonies on May 25, 1993. The mandate of the X̱wi7x̱wa Library is to “echo” the voices and philosophies of Aboriginal people through its services, collections, and programs. Kirkness, V. J., & Archibald, J. (2001). The First Nations Longhouse: our home away from home. Vancouver: First Nations House of Learning. Buy this book at the UBC Bookstore. Former Head Librarian of the Xwi7xwa Library (First Nations House of Learning Library) at the University of British Columbia, Gene Joseph is of Wet’suwet’en – Nadleh Whut’en descent. She is from the small village of Hagwilget in northern British Columbia. She has over three decades of experience in developing libraries for First Nations tribal councils, bands and organizations. One of Gene’s career highlights was the development of a legal research library for the Gitxsan and Wet’suwet’en First Nations in the Delgamuukw et al v. the Queen et al aboriginal title court case. It was one of the largest court cases held in Canada, as well as one of the first to extensively use computer systems in and out of the courtroom. More importantly to the First Nations people, there was extensive use of oral history in support of the case. Gene continued her commitment to aboriginal title through her work for the Haida aboriginal title case, working with the EAGLE (Environmental Aboriginal Guardianship through Law and Education) organization from 2002 to 2006. She continued her commitment to aboriginal title and rights through her work as a senior advisor and Director of Research and Litigation Support for White Raven Law from 2008 until her retirement in 2015. The Gene Joseph Scholarship is awarded in her honour. 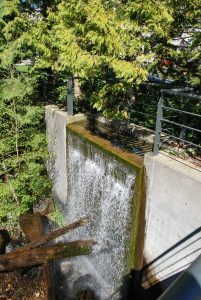 Our building is designed after structures built by Interior Salish nations. In the chinook language it is called a Kekuli, in English it is called a pit house, and in Ucwalmícwts (Lil’wat nation) it is called a S7ístken. Other nations that live in these homes are the Tsilhqot’in, Ktunaxa, Nlaka’pamux, and the Secwepemc. Although our roof is exposed they are normally covered with bark, earth, grass, and needles. The hole at the centre allows smoke to escape from the fire inside. 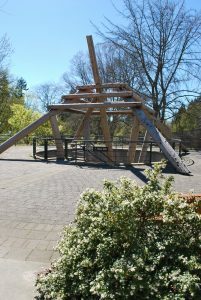 The central pole is used as a ladder to enter and exit but visitors are unable to use this feature with the absence of notches to ensure proper footing. Visitors must use our staircase and accessible ramp instead. Our branch is 198 square metres and half subterranean. Within, patrons have access to our collections, archives, computers and other technology equipment, and gender neutral washrooms.